In the previous On The Table I wrote that this week was going to feature daffs, daffs and more daffs. It does - below. Meantime this, left, is a bit of a cheat. It's never been near our garden but has been on the table for the past couple of weeks. 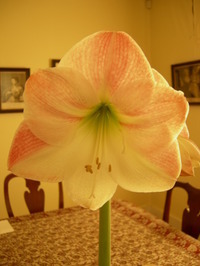 Amaryllis is the sort of plant that looks as if it's taken more steroids than an unclean Olympic sprinter. It has gotten so top heavy that I've staked it with the cornus stems I was eyeing up. 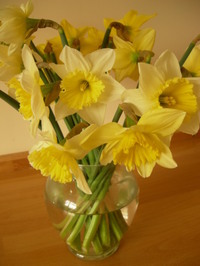 It's no surprise at this time of year that the fresh pickings of the week were daffodils from the allotment.